We have until Friday to get our submissions into Ithaca Fine Chocolates for their Art Bar art for 2007. Go here for the details. Essentially, Ithaca Fine Chocolates is a fair trade,USDA organic, swiss made chocolate company founded by an art historian and museum director, Erika Fowler-Decatur and her husband Michael Decatur. They were living in Endwell, NY, moved to San Francisco and then back to this area to raise their son near their family. Their thinking was to produce a high end product that would support global and local art education, provide a platform for new artists to get exposure, to foster recognition of of the importance and potential of art in education and society. What is not to love about this idea. Candy and art. The Willie Wonka concept of a little magic beyond a chocolate bar...and for those of us who are visual, another source of inspiration. Ithaca Chocolates is sold locally at Green Star, Wegmans and of course, Gimme. Kudos to Erika and Michael for moving back to central New York and bringing such positive energy and ideas to enrich the day to day. Makes it more interesting to get up in the morning. So--get those submissions in...but leave room for me! Won our game yesterday. Into the tournament semi-finals. Flipped a ton of burgers...the time sped by. A. is delighted that their team is moving up. A trophy is in our sites! 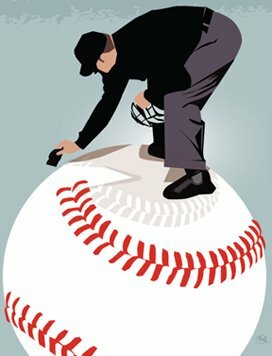 More on the baseball picture, my personal art director had some good input which I agree with and thought I would plug in.